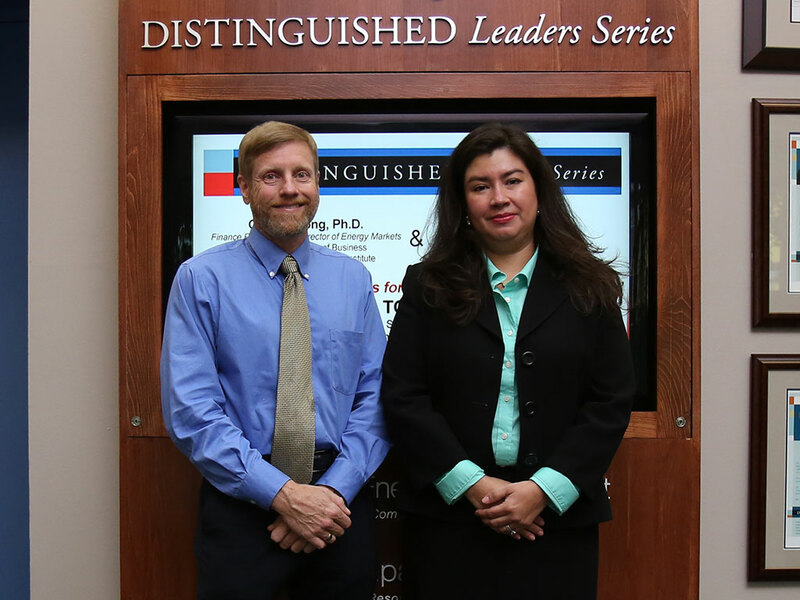 Bauer professor Craig Pirrong, left, and AGL Resources senior manager Katherine Torres talked Dodd-Frank and energy at the last Distinguished Leaders Series event of the spring semester. Sweeping legislation enacted in response to the economic decline of 2008 has implications beyond the financial services industry, according to speakers at a recent Distinguished Leaders Series event held at the C. T. Bauer College of Business. The evening’s second speaker, Katherine Torres, a senior manager of risk & control for AGL Resources, echoed Pirrong. The professionals dealing with swaps and trades are now making adjustments in their daily practices to comply with new laws, she said. Presented by AGL Resources and their Houston-based companies, the DLS serves as an opportunity for exploring topical issues in business, with an emphasis on the energy industry. Speakers are hosted on campus twice a semester for talks open to students, alumni, the campus community and local business professionals. To see photos from the April 10th DLS, click here. Bauer professor Craig Pirrong maintains a popular blog, The Streetwise Professor, and was recently asked by The Wall Street Journal to serve as one of its Energy Experts in an online series.